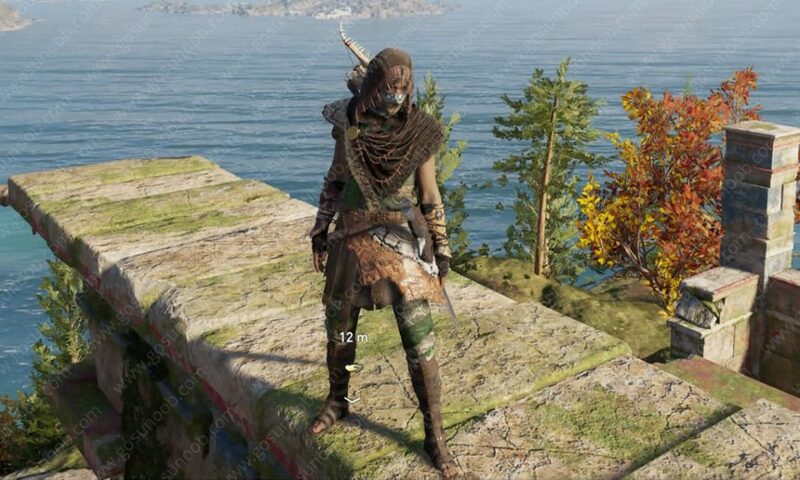 Snake set is one of the dozen or so AC Odyssey legendary armor sets. This outfit mostly consists of cloth, snake skin and fangs, and it will make your poison attacks more deadly. It’s one of the earliest legendary armor sets you can get, so you’ll probably get a bunch of use from it. This guide is going to show you where to find AC Odyssey legendary armor snake set, what it looks like, it’s perks, stats and bonus set. How to get Snake set? In order to get this legendary armor set in its entirety, you will have to go up against the Eye of Kosmos. They’re one of the branches of the Cult of Kosmos. You’ll find them in the upper left corner. They’re the easiest of the bunch, so you’ll probably acquire this set before any other. You don’t need to kill the boss in order to complete the sets – each of the five lesser cultists will drop a piece. This set will make you look like a proper assassin – hood, face mask, dark tones, sharp teeth as ornaments. The hood is made of dark brown cloth, its edge lined with fangs. There’s also a snakeskin face mask to go along with it. The bracers are black fabric, with more reptilian skin wrapped around it. The chest piece looks like a patchwork of skins from different snakes, with a hard leather pauldron on one shoulder and a dark gray shawl on the other. There’s also a bunch of necklaces made from animal teeth, as well as a golden brooch with a snake motif. I’ve already beat the game, but it never gave me the snake torso. WTH ?